2016 Season (Junior): Honorable mention All-Big Ten … ranked fifth on the team with 53 tackles … returned an INT — the first of his career — 36 yards for Ohio State’s first score in the win over No. 10 Nebraska … career-high eight tackles in the win at Oklahoma … seven stops in the win over Northwestern and again at Michigan State … also had 1.5 TFL and a PBU in the win in East Lansing … had five stops at Maryland … recorded two tackles and one PBU in the win over Bowling Green in his first career start … five tackles in the win over Indiana … two stops at PSU. 2015 Season (Sophomore): Webb played in seven games for the 12-1 Buckeyes and earned his second Varsity O letter … played a career high 36 plays in the season opener at Virginia Tech, including 18 plays on defense as the nickle back … totaled 10 tackles on the season. 2014 Season (Freshman): Webb he played in eight games for the College Football Playoff national champions in 2014 as a true freshman and earned his first Varsity O letter … played in five regular season Big Ten games, including a personal best 35 plays vs. Illinois, a game in which he lined up for a personal-best 21 plays on defense … recorded three tackles on the season plus a pass break-up and a forced fumble. 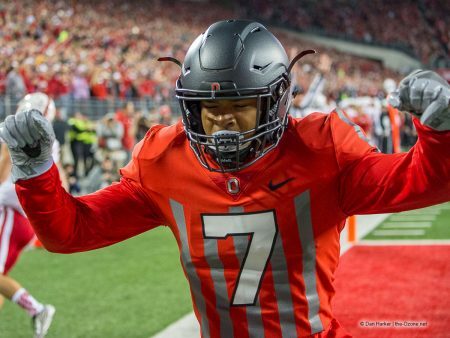 More on Damon: Webb, the second to commit to this Ohio State class of 2014, was one of the top players coming out of the state of Michigan — he was a 2013 Associated Press Division I-II all-state pick and the state co-player of the year — and was a consensus four-star prospect … he also was considered one of the Top 50 players nationally, with a ranking of No. 40 overall by Rivals with Scout (No. 42) and 247Sports (No. 43) concurring and ESPN rating Webb No. 58 on its ESPN 300 … at cornerback, he was ranked as the No. 5 prospect nationally by both Rivals and 247Sports, No. 6 by Scout and No. 8 by ESPN … selected as the No. 2 player in the state by the Detroit News Blue Chip recruit ranking following his senior season … also named the top defensive back in the nation at the U.S. Army All-America awards banquet … helped Cass Tech, coached by Thomas Wilcher, to the Detroit Public School League city title and to a state semifinal appearance in 2013 with seven interceptions, 10 pass breakups, four forced fumbles and 42 tackles … had two punt return touchdowns and seven receiving TDs … as a junior in 2012 helped Cass Tech win a second consecutive state title … transferred to Cass Tech from U-D Jesuit after his sophomore season … first Cass Tech player to sign with Ohio State since Vernon Gholston in 2004 … is the son of Stephanie and Damon Webb Sr.